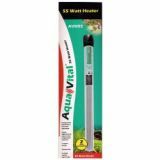 Aquavital 55 watt aquarium heater thermostats are for tanks upto 45 litres. They carry a full 12 months warranty agains electrical failure. Aquavital 150 watt aquarium heater thermostats are for tanks upto 80 litres. They carry a full 12 months warranty agains electrical failure. Aquavital 200 watt aquarium heater thermostats are for tanks upto 100 litres. They carry a full 12 months warranty agains electrical failure. Aquavital 250 watt aquarium heater thermostats are for tanks upto 125 litres. They carry a full 12 months warranty agains electrical failure. Aquavital 300 watt aquarium heater thermostats are for tanks upto 150 litres. They carry a full 12 months warranty agains electrical failure.